** WP 8.0 FEATURES ** Fox News v4.0 supports voice commands and wide live tiles for news and shows! 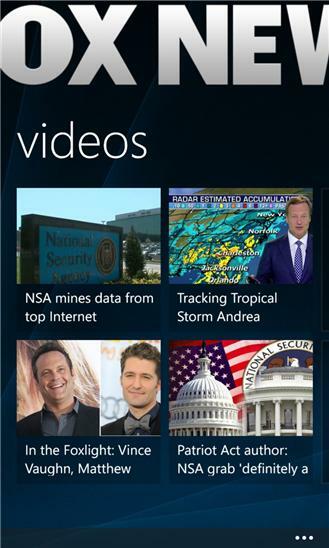 You can pin your favorite news categories or Fox News Channel shows to your Start screen! The Most Powerful Name in News™… now on your Windows Phone With the Fox News app for Windows Phone - read the hottest stories of the day, browse through photo galleries, and watch the latest video clips from Fox News Channel, all for free! 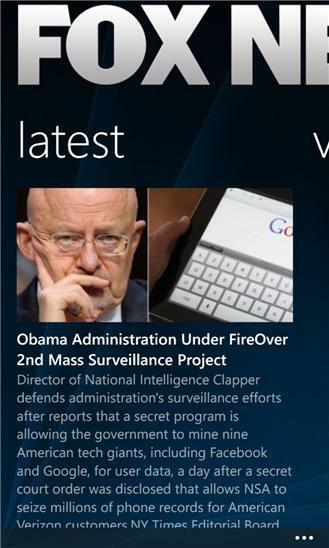 Live Tile • Pin the Fox News app to your Start screen for a snapshot of the top story. The Live Tile updates for the latest news coverage at your fingertips. Shows • Catch up on your favorite Fox News Channel shows with video clips from recent episodes. View the TV schedule to find out what’s on Fox News Channel. Videos and Photos • Scroll through the latest videos and watch the day's top stories. Dig deeper into Entertainment, Politics, Health and more to explore videos and slideshows on your favorite topics. Breaking News • Get breaking news delivered directly to the app as you browse your favorite news sections. Tap the breaking news banner to follow the biggest stories as they unfold! Share • Connect via Facebook, Twitter, or email to share all of your favorite articles, videos, and slideshows by tapping the "share" button. Save • Save articles, videos, or slideshows for later, simply by tapping and holding any headline or by tapping the "save" button. We Report. You Decide®… On-The-Go!